Separates large numbers of PCBs without fatigue of the operator. The lower circular blade is driven by a motor. The PCB is fed between the circular blades where it is seized, transported and separated. Three different speeds can be selected. Compact, fast and economical PCB separator for PCBs with pre-scored groove. 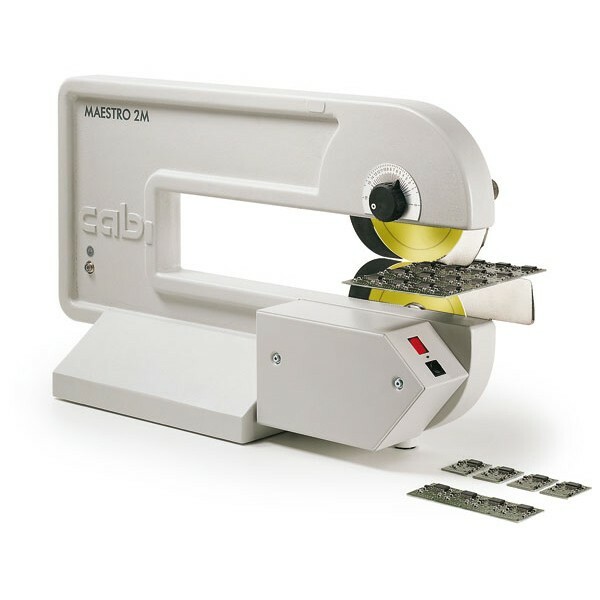 MAESTRO 2M motorized: Separates large numbers of PCBs without fatigue of the operator. The lower circular blade is driven by a motor. The PCB is fed between the circular blades where it is seized, transported and separated. Three different speeds can be selected. Strain of components: Frequently for critical components an upper limit of tensile stress will be determined. Please ask us regarding possibilities to reduce tensile stress of components.